The Bureau of Labor Statistics publishes an employment outlook each year that gives evidence to a growing crisis in healthcare. Nursing assistants make up a vital part of the nursing workforce, and as far as projections go, the profession is expected to realize unprecedented growth in the next decade. Certified nursing assistants (CNAs) work primarily with the senior population who may need assistance with the activities of daily living. 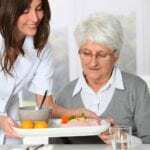 They work in long-term care facilities, assisted living facilities, nursing homes, and home health. They may also work in correctional facilities, hospitals and clinics. The work is grueling, often due to long hours without breaks and unpleasant duties. However, those called to patient care derive personal satisfaction from caring for others. CNA training programs provide the foundational study that help graduates advance to nursing educational programs to become a licensed practical or registered nurse. Rochester Community College’s Nursing Assistant program prepares students for entry-level employment. Graduates have the essential knowledge and skills to care for patients and residents in various acute or long-term settings under the direction of a licensed nurse or physician. Students seeking to work in a long-term care setting must take the Nurse Assistant Registry Exam available through RCTC’s Workforce Education Center. Students enrolled in the program must complete 16 credits for the Advanced Hospital Nursing Assistant Certificate. Course topics include medical terminology, body systems and diseases, reading and writing critically, CPR for the health care professional, nursing assistant theory and clinical, hospital nursing assistant, and psychology of adjustment. Prerequisite courses in English and psychology may apply. Applicants must take a national criminal background check – there is a $55 fee for the check. The program is offered several times throughout the year and during the summer sessions. Tuition for the program is $3,002 plus $853 for books and supplies. The Samaritan Bethany Nursing Assistant Training Program is approved by the Minnesota Board of Nursing. An experienced registered nurse instructor teaches the classroom and clinical sessions. The classroom is located at Samaritan Bethany’s corporate office. Clinical sessions are at Samaritan Bethany’s rehab center. Full-time and part-time schedules are available. There are three seven-week part-time classes and two special four-week full-time sessions held each year. Daytime classes meet from 9 am to 1pm. Evening classes meet from 4 pm to 8 pm. The class size is limited to 10 students per class. There may be a waiting list so applicants are encouraged to apply early. Graduates are eligible to take the Minnesota State Nurse Aide Exam for placement in the Nurse Aide Registry. The tuition is $575 and includes textbooks. The nursing assistant program at Madonna Towers of Rochester prepares students for employment in long-term care. The curriculum includes classroom lectures and supervised clinical experiences to prepare students for success on the state certification exam. Classes meet Monday through Friday from 8 am to 4:30 pm for two weeks. Course topics include infection control, vital signs, communication, mental health, nutrition and feed, patient transfers, emergency procedures, law and ethics, and end of life care. Applicants must be 18 years or older and be able to read, write, and speak English effective and follow oral instructions. Contact the center for the next class schedule and cost. The nursing assistant program at Winona State College helps students develop the skills and attitudes to care for patients in long-term care facilities. After the completion of 60 hours of classroom sessions and 20 hours of supervised practice in a clinical setting, graduates will receive 3 college credits. Course topics include medical terminology, anatomy and physiology, feeding and nutrition, vital signs, patients’ rights, and rehabilitation and restorative techniques. Daytime classes meet Monday through Friday from 8 am to 4:30 pm for two weeks. Evening classes meet Monday through Friday from 4 pm to 9:30 pm for three weeks. Students must provide a recent Mantoux test result, social security number, and driver’s license number by the first day of class. Graduates can apply to take the state certification test at Winona State. Tuition for the program is $578.29 and includes college fees, manual, supplies, and background study. Saint Anne Training Center offers two Minnesota state-approved nursing assistant programs: a 75-hour and 120-hour curriculum. They include clinical skills and classroom instruction to prepare students to provide high-quality care under the supervision of a licensed nurse or physician. Instructors emphasize clinical competency and overcoming issues related to elderly care. Applicants must be 16 years or older. The class size is limited to 10 students. Classes meet Monday through Wednesday from 6:30 am to 5:00 pm. Graduates are qualified to take the state exam to become a Certified Nurse Assistant. Tuition for the program is $600 for the 75-hour class and $850 for the 120-hour class. A non-refundable fee of $100 or $150 must be paid for registration at the time of enrollment.